If your last name will soon be Goldstein, read no further! Okay, for the rest of you, I'm in my friend's wedding next week and another bridesmaid is throwing her a "personal shower" (realllllly not my thing). I never follow gift giving rules, so this is my contribution to the personal shower. The main apron body is linen and the rest is some patchwork pieces. Yeah for getting to sew this week!! Keri, it's darling! 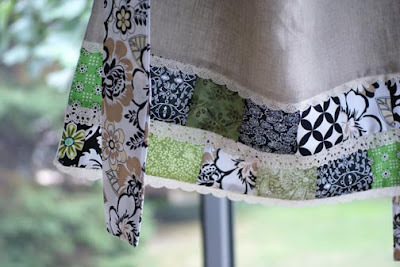 I always love your sewing projects -- your creativity, your fabric choices, everything! Thanks for being an inspiration :-) Your friend will *love* it! You have the best ideas! Looking at your creation makes me want to buy some cute fabric and get sewing. Oh, Kerri! It's so pretty and feminine! She is so going to love it. I agree about the fabric choices. They really are so pretty and well coordinated. My favorite detail would be the lace trim.